No more separate notification tones in Oreo? I have a Galaxy S8. With the recent operating system update, it removed all of my personalized text notification tones. They are now all the same. I cannot figure out how to change them back. Anyone have a clue? Unfortunately, it seems that Google has removed the ability to assign contact-specific notification tones from Android 8.0 (Oreo), so it isn’t possible at the moment. Of course, it’s possible that they’ll add this feature back in at some point, but nobody here is able to predict when (or even if) that will happen. One potential work-around exists, but it involves using Android Messages instead of the stock Samsung messaging app. Download Android Messages from the Google Play store, then open the app and start a conversation with someone. While in the conversation view, tap the menu button (three vertically-stacked dots in the upper right corner of the app), then tap “People & options.” This will present you with the option to assign a ringtone to this conversation. If you ever delete this conversation, however, you’ll have to go through this process again to re-assign your desired ringtone. If you decide to use Messages as a work-around, you’ll also want to make it your default messaging app. On your Galaxy, open Settings -> Apps, then tap the three-dots menu in the upper right. Tap Default Apps -> Messaging app, and change the default to Android Messages. hallux, coffee-turtle, Javier P and 1 others like this. Since this question seems to come up quite a bit I have made this thread a sticky. Community members please feel free to direct folks here in the future when this question comes up! Google's Contacts app had this functionality in it? 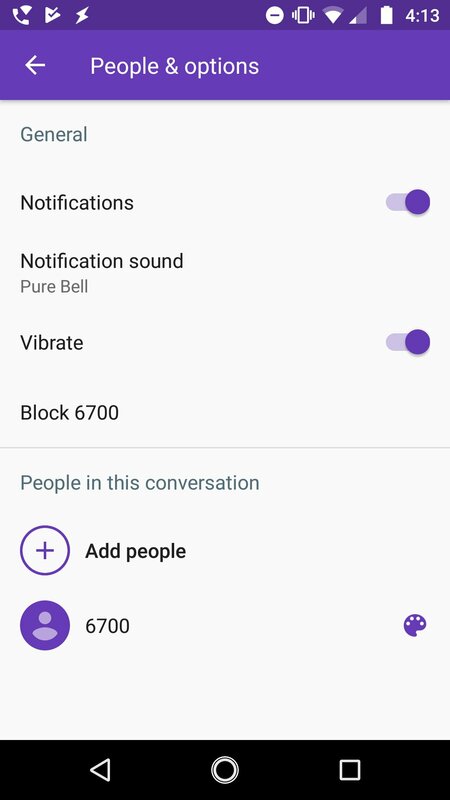 Does Samsung's Messages app have the ability to set a per conversation notification tone? I’m not sure about Google Contacts. I’ll install it later and find out. At least on the carrier-branded S9/S9 Plus in the US, no, there are no per-thread notification tones. Neither Google Contacts or Android Messages (Google's SMS app) has it (or any settings per conversation). I tried Google Contacts, and no, it doesn't allow for personalized messaging tones (but you can set ringtones). I'm not pleased at all with the removal of individual text notifications. To make matters worse if I decide to use a 3rs party app for messaging than edge lighting won't work. I really enjoy the edge lighting feature when my phone is silent or on vibrate so I can see when I have an incoming message I've not been able to find a 3rd party app that the edge lighting works with. Does anyone know of any messaging apps that have individual notification sounds that works with edge lighting? Mommadragon37, ttdale and jb1t like this. I use Verizon message app now, you can add tones to each contact and it doesn't delete off if you delete messages. not sure about the light up function as I don't use it. .
Mommadragon37, ttdale, MichaelAllred and 1 others like this. Textra is the way to go. No!! They need to quit following Apple!! This is what ruins it for a lot of people. They have it then take it. There should be no excuse for this on any device this day and age. Glad I stumbled across this thread! Looks like I won't be upgrading my N8 to Oreo when it comes out because of this nonsense from Google. I've been trying to change to your suggested android "message" app, have uinstalled, opened, all looks good & even changed my contacts alerts back. Gone through the process of changing app to the new "message" option. Rejected galaxy option when opening sms's, even turned off galaxy "message" somewhere (cant renember), restarted my phone, BUT it still defaults back to the galaxy app. HELP!!!!! sorry, that was meant to read INSTALL. not uinstall. i am getting very frustrated with this update as i had it all worked out before. i new who was texting me by the message tone. I updated my Galaxy S8 before traveling internationally last week, per the directions on the Sprint site. Previously, I had the field and ability to set individual text notifications per contact, so I would know from whom I was receiving texts. Now, that feature no longer exists, and it's extremely frustrating. Most people are talking about it missing on the S9, but I don't think it's an S9 issue; I think it's an Oreo update issue. Not helpful, but I filled one out. Has anyone gotten confirmation that they will roll out a fix for this? If not, I'll be going to a third party text app. I'll miss the edge light, but the sound is much more helpful. This is ridiculous! I use this to know if certain people (my kids espically) are texting me and need an immediate response or if (work) I can reply when I have the chance. This is the MAIN feature I LOVE on my Note 8, if they don't want to bring it back I know myself and quite a few others with business accounts that will drop Samsung and go to iPhones that do have this feature. I am so peeved right now, as is our IT manager. Mommadragon37 and MJazzy like this. Is the individual contact custom notification that's missing with the Oreo update only for text messages or is the option to choose individual ringtones for each contact on phone calls also missing? If it's only texts, I already have a workaround planned but if it's missing for ringtones for calls as well, I'll not update to Oreo. Got the answer elsewhere here. It's only for text messages.. Please what is your work around??? Hi my question is somewhat related but not really, I just updated my s8 and had all of my what's app messages set to "no popup"meaning there is no preview. However since updating I'm getting previews even though all my settings have been set to exactly the same as before. I've even uninstalled the app! Is this because of the software update?? Thanks! I just switched to Textra last week only because I got Google Keyboard and it has Bitmoji option from the keyboard and I couldn't send a gif or Bitmoji through the keyboard on stock messages. I have used Handcent in the past and most recent Textra until I got my 7 edge and could do the tones for each contact and I liked when you used to have the circles at the top for favorites in the Samsung stock messages. Plus the stock matches your theme but anyways so last week I get Textra than I realize I can't get text on my watch making Textra the default I have the Gear S3 so i made stock my default again and figured I'll just use Textra when I want to send my dad a gif or Bitmoji through the google keyboard and now I got Oreo yesterday on my unlocked Note 8 and my friend Mary just texted me and I didn't hear it play Proud Mary LOL! So now Textra is back to being my default and i just won't see text on my watch having the specific tones is more important to me and I liked Textra and have used it before. I also sent Samsung a feedback message regarding this issue. I have been able to set custom text alerts for specific contacts for over 10+ years! The Razor I had back in the mid 2000's had that feature. So, as advanced as Samsung phones are it is absolutely ridiculous that it's 2018 & the Note 8 doesn't have this feature. Samsung better get it together. delynnie and MJazzy like this.